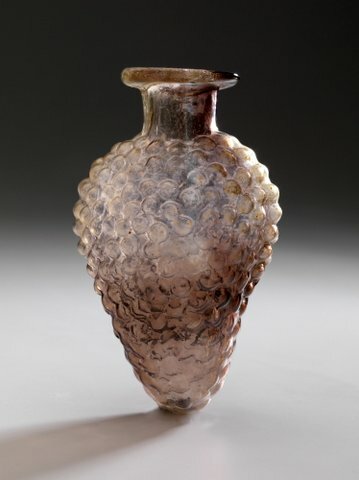 The Yale University Art Gallery’s (http://artgallery.yale.edu/), collection of ancient glass represents one of the most varied and comprehensive holdings in the nation. Acquired through the gifts of Yale alumni over the course of seven decades, the collection illuminates the technological, functional, and stylistic developments in glass from the Bronze Age to late antiquity. In the publication, Ancient Glass: A Guide to the Yale Collection, the author R. A. Grossmann uses the collection to acquaint the reader with techniques for producing and adorning glass objects. Vessels, both practical and decorative, as well as jewelry and ornaments are discussed in historical and aesthetic contexts. Grossmann also provides information about the acquisition of the works and the University’s involvement in archaeological discoveries. 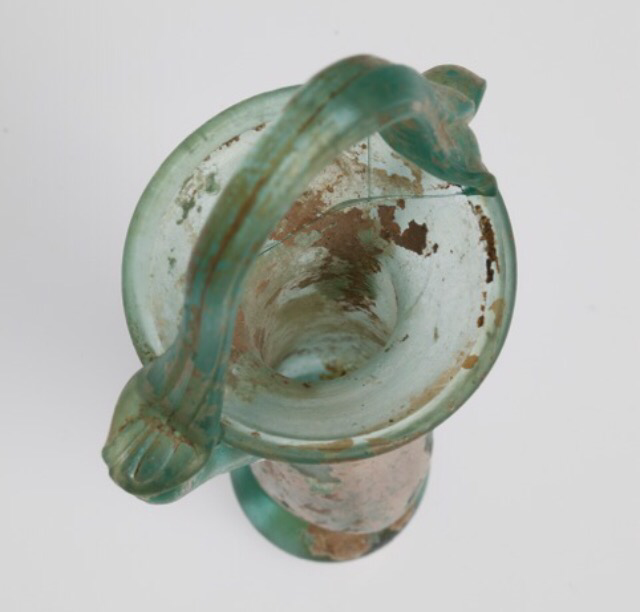 This active link is a search site of complete ancient glass collection at Yale University. 2nd century AD, possibly earlier. Syro-Palestinian. H= 9.0 cm. D max= 5.5 cm. D rim= 3.0 cm. Weight 29 gr. Classification: Isings: Form 91a (without handles). Technique: Body blown into a two-part mold of two vertical sections with an oval circumference. (MCT VIII D). Relief crisp. Neck and mouth free blown. Description: Transparent streaked pale and darker manganese colored glass. Irregular inverted piriform body with poor flattened base (vessel cannot stand). Body shaped like a cluster of grapes. Short cylindrical neck with outsplayed rim, folded outward, upward and inward. 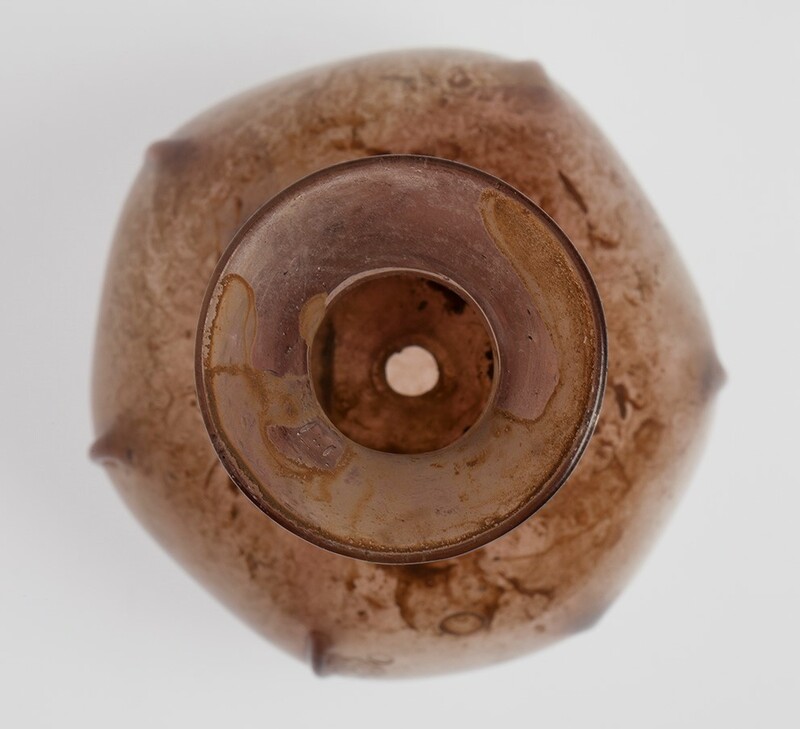 Remarks: Bottles in the shape of a naturalistic grape cluster were made in both the Eastern and Western parts of the Roman Empire. Grape cluster bottles from the second century and later are longer than those of the first century. 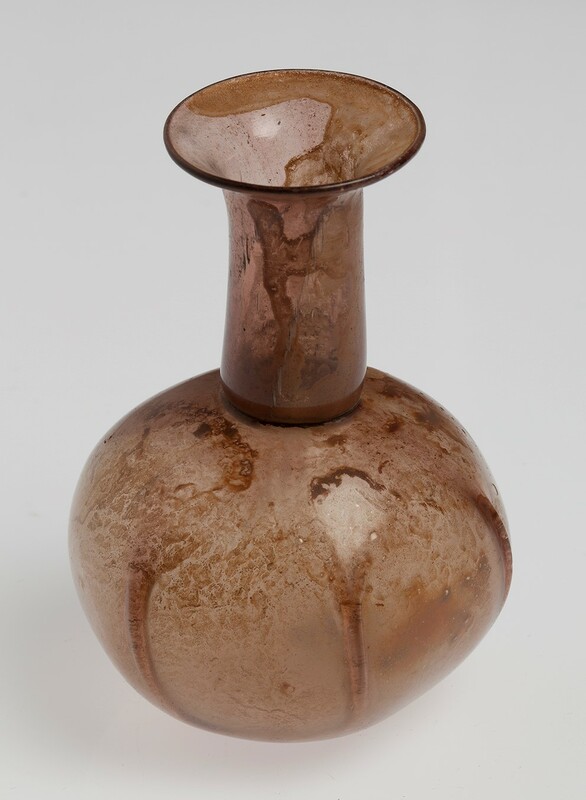 Bottles found in the West usually have two handles, while those of the eastern find spots have no handles. Provenance: Ex collection David G. Giles, London. Published: Groen & Rossum 2011, Romeins Glas uit Particulier Bezit, p. 87. Antiek Glas 2001, video film Allard Pierson Museum. Beek 2001, Antiek Glas, Cat. No. 126. Christie’s 8 April 1998, No. 18. Bonhams 10 June 1997, No. 84. References: Stern 2001, Ernesto Wolf Collection, Nos. 70-71. Saldern 1974, Oppenländer Collection, Nos. 472-473. Loudmer 1985, Collection Monsieur D., No. 279. Sotheby’s 4/5 June 1979, Constable Maxwell Collection, No. 75. Stern 1995, Toledo Museum, No. 119. Bonhams 24 June 1998, No. 186. Technique: Blown to a pearshaped form; with flaring mouth and rounded rim; hollow footring attached; concave base with pontil mark; handles drawn up from three-quaters of the body and attached to the rim; basket handle placed at the rim on top of one sidehandle to the opposed, surplus glass folded back. Description: Tubular to piriform body of light-blue glass; basket handle and foot darker in colour; flaring rim; rounded foot placed unevenly. Condition: Complete, crack in the funnel mouth; elongated bubbles, silvery and golden iridescense, weathered, some adhering dust. Remarks: Acording to Whitehouse referring to a similar glass in the Corning Museum, no 741, volume II, ‘an object such as this is unusual in having both the conical foot characteristic of cosmetic flasks and a basket handle that is typical of multipart cosmetic tubes.’ See also Kunina, 1997, no 414, p 335. Provenance: Syro-Palestinian. From a private dutch collection. First publication. Reference: Spartz, nr 143, 33.; La Baume, Cologne, I nr D 79; Liepmann nr 130; Sammlung Hentrich, nr 103; Hayes, 1975, pp 82-83; Kunina, 1997, no 414, p 335; Whitehouse, 2001, CMG vol II, p 192, no 741. Late 2nd – 1st century BC. Syro-Palestinian. H= 5.0 cm. D max= 12.8 cm. D rim= 12.8 cm. Weight 190 gr. Condition: Intact. Surface well preserved. Technique: Cast from flat circular blank, sagged over a former-mold and tooled.Ground and rotary-polished on interior, fire-polished on exterior. Description: Translucent natural olive green glass. Bowl with convex sides and slightly concave bottom. Twenty-one asymmetrical ribs that are unevenly sized and spaced and set at varying angles and levels around the body. Most ribs have been ground away at the top, others were positioned too low to be touched by the grinding tool. The rim unevenly rounded. Tooling marks visible on the rounded edge of rim and on exterior wall above the ribs either horizontal, vertical or oblique. Grounding marks below the rim on both interior and exterior. Remarks: The irregularity of the ribs and the tooling marks on and below the edge of the rim may suggest, that this bowl was manufactured by sagging over a former mold, mounted on a slowly rotating wheel and by tooling the ribs. This tooling of ribs required skill and experience, so that bowls with almost clumsily formed ribs (as on this bowl) are the earliest. Thus this bowl might belong to an experimental phase within the 2nd century B.C. Whether ribs were to strengthen the vessel wall or merely served as decoration is uncertain. 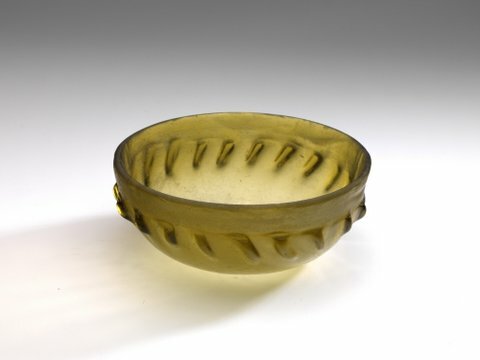 This bowl stands as a precursor to the early Roman ribbed bowls, that have more evenly spaced and shaped ribs and appear in bright and colored fabrics and in different proportions. Provenance: Collection P.L.W. Arts, 2002. Published: Arts 2000, A Collection of Ancient glass 550 BC – 500 AD, No. 11. Exhibited: Thermenmuseum Heerlen (NL), Romeins glas uit particulier bezit, 29 April – 28 August 2011, No. 004. References: Arveiller-Dulong 2000, Musée du Louvre, No. 217. Metropolitan Museum of Art, accession number 17.194.196. Annales AIHV1996, “A ribbed bowl from a late Iron Age burial at Hertford Heath” by Jennifer Price. Sheppard & Cooper 1976, pl 4 (now in British Museum). Late 3rd – 4th century AD. Eastern Mediterranean. H= 9.2 cm. D max= 6.9 cm. D rim= 5.8 cm. Weight 55 gr. Condition: Intact. Brilliant multi-colored iridescence. Technique: Body pattern-blown, neck and mouth free blown. Description: Transparent yellowish green glass. The spherical body on a flattened concave base with pontil mark. Tall cylindrical neck with constriction and inner diaphragm at its bottom, slightly tapering to a broad flange rim, outsplayed horizontally, turned up and in and flattened. Wall decorated with expanded mold-blown swirling ribs, descending from upper left shoulder to lower right bottom. Published: Groen & Rossum 2011, Romeins Glas uit Particulier Bezit, p. 77 and 82. Arte Primitivo 24 January 2003, No. 232. Exhibited: Thermenmuseum Heerlen (NL), Romeins Glas uit Particulier Bezit, 29 April – 28 August 2011, No. 157. References: Whitehouse 2001, Corning Museum, No. 621. Saldern 1974, Oppenländer Collection, No. 495. Stern 2001, Ernesto Wolf Collection, No. 140. Technique: Free blown globular body, tooled with 6 ribs, free blown cylindrical neck with diaphragm at bottom made by folding. Description: Translucent aubergine colored vessel with 6 vertical ribs; narrow pinched neck; out-splayed rim; rounded; slightly concave base; no pontil mark. Condition: Good, no cracks, little weathering, some adhering sand. 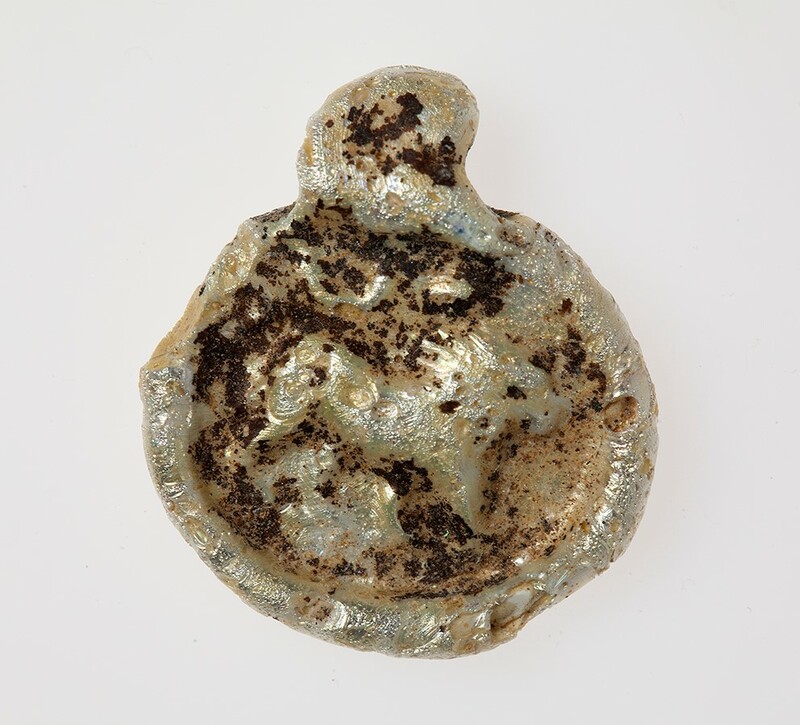 Remarks: Dateable examples come from Pompeii, Naples Museum, Nijmegen, Museum Het Valkhof/ Kam Museum, Dura Europos, according to Isings, which means the form has been in use over a long period of time. Provenance: From a private Dutch collection. First publication. Reference: Hentrich Collection 1974, p 80, no 74; Auth 1976, p 120, no 148; Bomford Collection 1976, p 29, no 117; Platz-Horster 1976, p 87, no 175; Whitehouse, 2003, CMG vol. III, no 1155, p 151. Technique: Translucent glass blown to a globular shape, with wide flaring neck, rounded rim; two handles applied, dropped on the shoulder, pinched with a tool, drawn up and pinched again at three fourth towards the rim, attached to the rim, excess part pinched for the third time and placed horizontally above rim; slightly concave bottom, no pontil mark. Description: Handles made of the same translucent glass; heavy light brown encrustation mixed with silvery iridescence almost all over the body, leaving practically no place uncovered. Condition: Complete with no cracks. Remarks: According to the typology of handles by Morin Jean (1913), no 5: Anses faites a l’imitation de types métalliques, type λ , handles made in imitation of silver and bronze vessels (formes 93-95 du tableau du morphologie générale) the amphoriskos can be dated as from the first to the second century A.D. Hans van Rossum states the technique, the way of folding the handles, has been in use troughout the centuries as far as the 6th. century and points at the two handled jar in the Museum of Newark (no 181, p. 142) of the 6th-7th century, also with a wide flaring neck, bringing the amphoriskos into the Islamic era. Provenance: From a dutch private collection. First publication. Isings form: 62. Second half of the third century A.D. Technique: Free blown bottle with four unevenly flattened sides indented with a tool; rim splayed out to the diameter of the body, turned down and tooled horizontally; rim rounded. Description: Jar of translucent glass with blue silvery iridescence and black encrustation; spherical body with four asymmetric sidewalls in which four roughly-shaped round dents; concave base; no foot-ring; no pontil mark. Condition: Intact and complete, no cracks. Heavy black and silver iridescence. Remarks: From the Rhineland. According to Stuart Flemming this kind of vessel is quite identical to one found in a physicians grave in Cologne, Germany. (Kuezl, 1983, Germ. 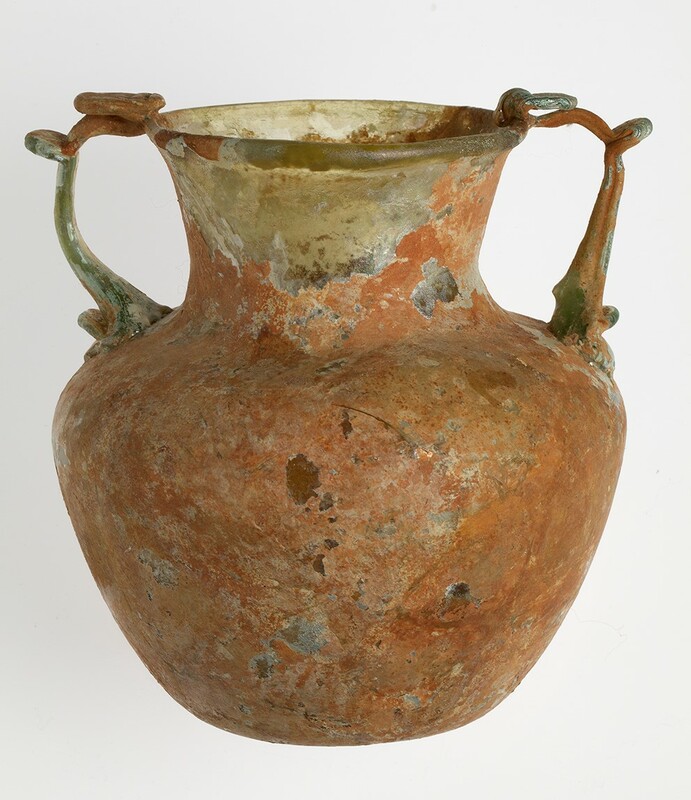 Inf.7), According to C. Isings the flaring rim is a variation of the square jar in general, with differences in thickness of the glass with lots of finds from Pompeii in variation. Reference: Morin Jean, 1913 p. 145. Isings, 1957, form 62, p.81. Fremersdorf 1957, Die Farblosen Glaeser: p. 53, no:128. Auth, 1976, p. 137, no:172 and p. 221 no’s: 465 and 466 Kunina 1997, p. 314/317, no: 311 Fleming 1999, p. 111, no: E.112. Mid-4th. to early 6th. century. A.D. Technique: stamped; large loop applied; flattened backside. Description: Walking lion with straight manes, descending to the right; vague text of four greek letters, placed between the loop and the lion, not in reverse, most likely : έισ θ(εοσ), (h)eis and th(eos) , that can be translated as: ‘one god’. Condition: Roughly circular disk of opaque yellow-white glass; at the top left side a small chip is missing as it is for the right lower side; silvery iridescence on all high relief parts; black weathering around the figure and text. Remarks: Barag, 1970, type A, category 5(Animals), Zoudhi type If. The lion presented as a symbol of alertness and watchfullness. It is regarded as a symbol of Christ, the Lion of Judah. The myth that lion cubs are born dead but come to life after three days, is a tale which reminded early Christians of the Resurrection. The Staatliche Kunstsammlungen Kassel owns a glass chain or necklace with ten glass pendants of which four discs are represented with lions. One might come to the conclusion that the medallions where not necessarily worn as single pieces, but in a constellation of protective symbols, to bring good fortune or to ward off the evil eye. The function of token or weight is hardly plausible, for the disk is extremely small and likewise in weight, very light. Literature: Monneret de Villard, 1922, Exagia Bizantini in Vetro, Rivista Italiana di Numismatica 2-3, pp 93-5; Jungfleisch, 1932, Les Dénéraux et Estampilles Byzantins, pp 233-256. 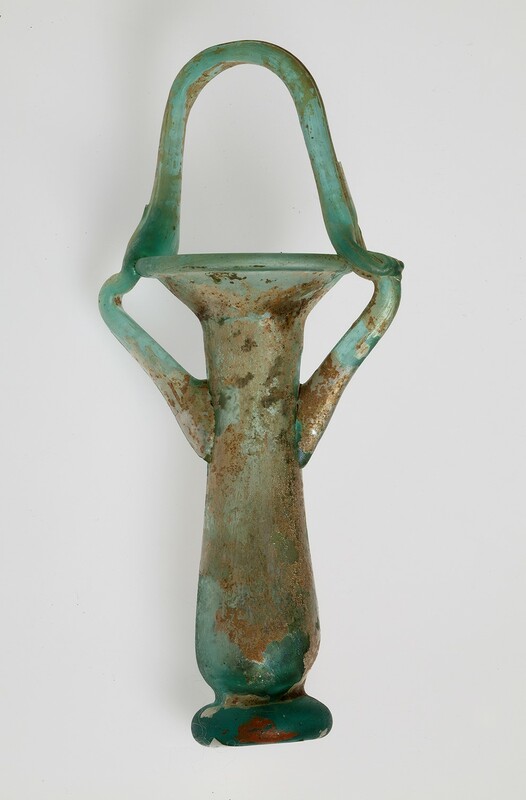 Verre de la Collection Froehner, Bulletin de l’Institut d’Egypte, 14.; Glass from the Ancient World, 1957, The Ray Windfield Smith Collection, Corning Museum of Glass. Section IV, p 195-197. Reference: Bomford Collection, Bristol, 1976, no 81, p 24. Staatliche Kunstsammlungen Kassel, 1984, no 192, p 92. Spartz no: 160, Taf. 38. Naumann no: 20, Taf 4. Whitehouse, 2003, CMG vol.II, no’s: 891-893. 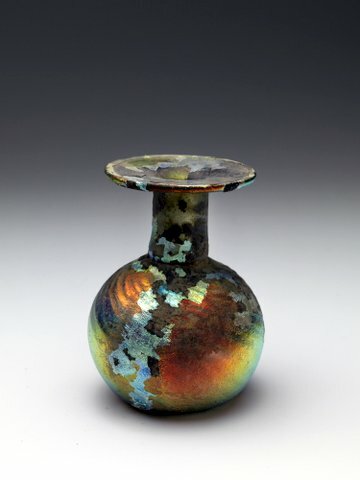 This is a pictorial posting of the natural beauty of iridescence on ancient glass. 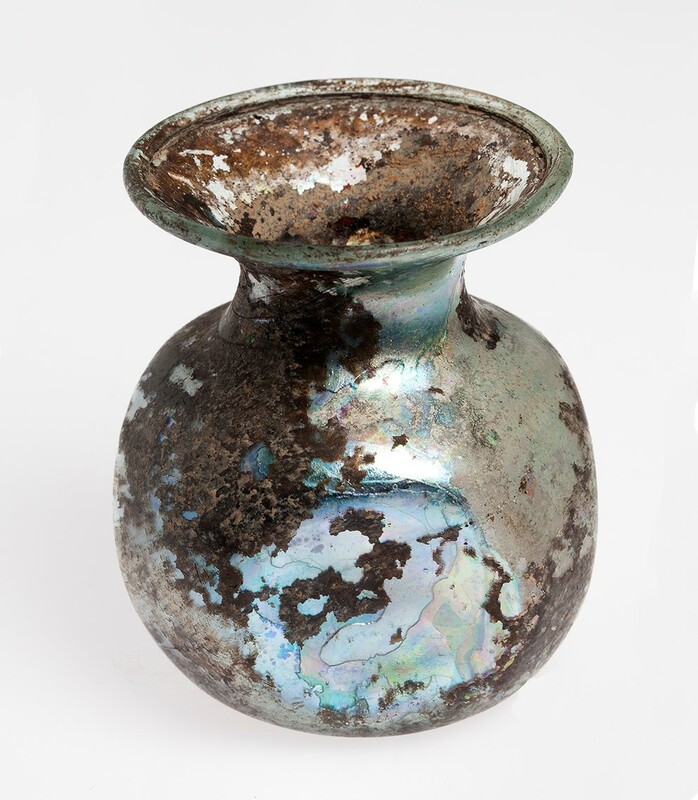 For a more technical explanation and additional examples open this link: What is iridescence on ancient glass? This is a link to the The Legion of Honor Museum posting.